A tough, grasslike plant grows in a wet marshy area. Many round stems of shiny dark green are clustered together; some are topped with a pointy little brown spike that is actually a head of unobtrusive flowers. This is common spikerush, or Eleocharis macrostachya. Get out a hand lens and look at the flower heads–they are really quite spectacular. Feathery white styles and nodding tongue-shaped stamens cover the little blooming spike in a complex tangle. 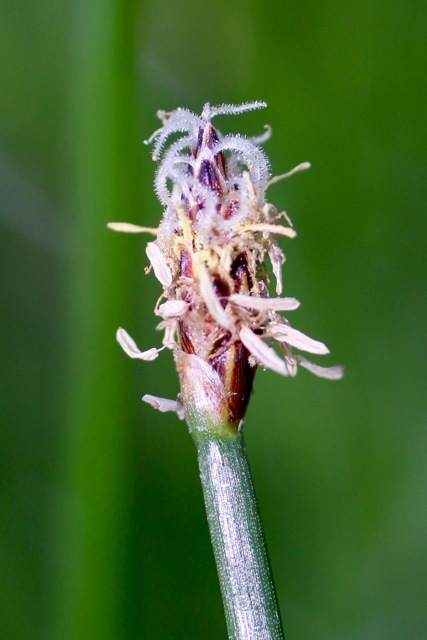 There are no petals on this plant: the reproductive bits simply peek from behind a diminutive brown scale (see the close-up photo above). This is characteristic of the spikerushes, and other rushes, sedges, and grasses in general. All the spikerushes (which are actually in the sedge family, Cyperaceae) have photosynthetic stems and no leaves to speak of. Unlike most sedges, the perennial common spikerush has a stem that can be either flat or round. A thin green sheath, several centimeters long, that is around the base of the stem is actually a modified leaf. Common spikerush has two feathery styles peeking from each brown scale, which has a green midrib running its middle. The flower spikes are more than 7 mm long, and often up to 25 mm long. The plant sometimes grows up to 9 feet tall (though the plants I saw were only a few feet tall). This species is found in wetlands across most of the United States.